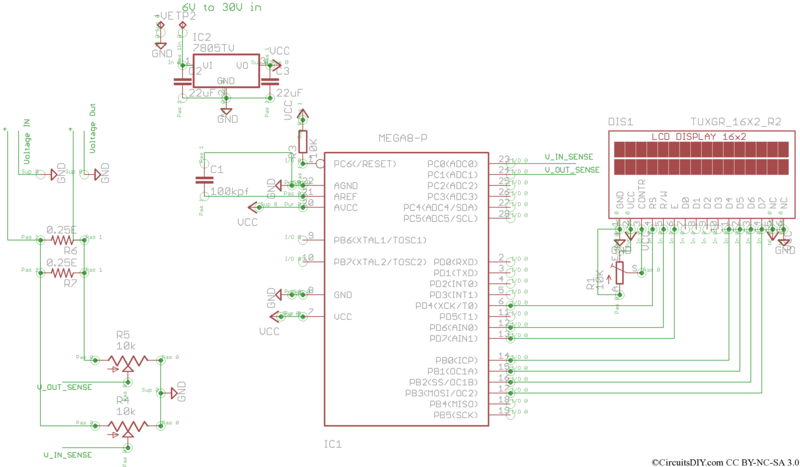 This project uses the ADC feature of a popular AVR, Atmega8. 1x High quality Veroboard 2.5?x4? ADC stands for Analog to Digital converter, it converts analog voltage level to equivalent binary. Atmega8 has 10bit ADC which can also be used in 8bit mode for better accuracy. In this application, 8bit mode is used, so we have digital reference limits as 0(low) and 255(high). The analog voltage reference is used at 5V here, so we get 5/256=0.01953125V resolution. We used 10K multiturn potentiometer to fine adjust the voltage divider at ADC0 with appx 5:1 division so we get 25.5V max in voltage input. 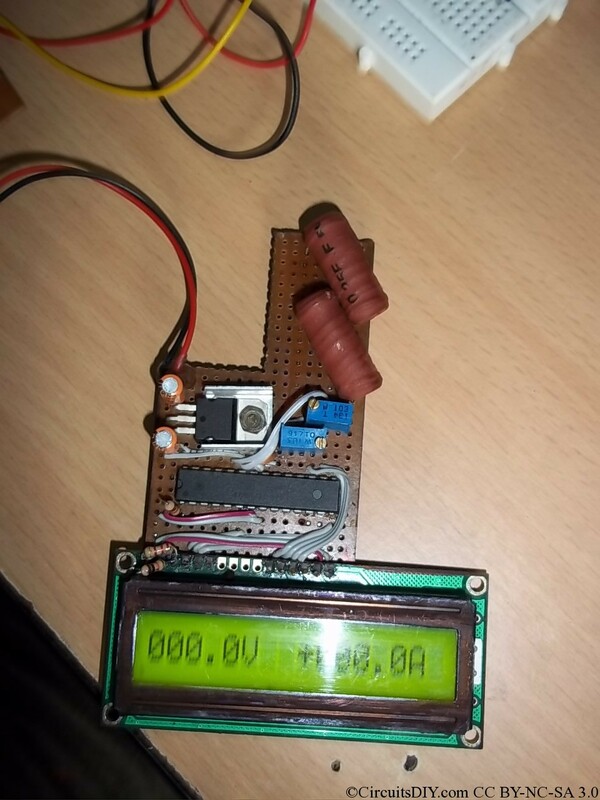 Simply the ADC data is divided by 10 and we get voltage, and thus the resolution of this voltmeter becomes 100mV. The current sense resistor used here is a parallel of two 0.25E/5W resistor totaling 0.125E/10W. So, at every Amps, there is 0.125V drop. Our setup can sense 100mV division, and hence the Ammeter resolution is 800mA. The inetrnal factory default 1Mhz RC clock is used here, and no external crystal or resonator is used. Click on the circuit diagram for high resolution picture. If the firmware is upgraded with 10bits ADC resolution, then the fine resolution will be 25mV and 200mA. If current sensing resistor used has higher value, like 1E/10W along with 10bits ADC, then Ammeter resolution will be 25mA. Connect (via switch) a 6-30V DC supply to the voltage input. this is for running the meter including the LCD. Connect +5V(from output of LM805) to any large pad in the bottomside, i.e, Vin(+) or Vout(+) anything and turn both presets until LCD shows 05.0V +000.0A . Now connect the source supply from solar panel to any pad and derive the output from any other pad, if Amps is shown as -ve when load is connected, you simply need to reverse the wires of V_In and V_Out. A picture of my prototype below. Questions, comments or enquiries? Drop them below. #include “lcd.h” shows error directory not found while simulating in avr studio4. please reply me fast how to solve this problem.